Papercrafting by G: Nesting Flower Embellishments: My Favorite Flowers! Nesting Flower Embellishments: My Favorite Flowers! Pre-made embellishments can get pretty pricy at craft stores, so I sometimes enjoy making my own in order to save money. I love to die cut flowers, and when I saw the Nesting Rose Die set by We R Memory Keepers, I knew I had to have it! It has since become my favorite flower die set, and I use it very frequently. 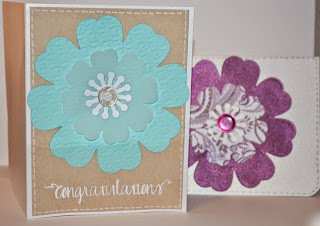 In these two cards, I will show you how I alternate between patterned paper and embossing folders to create unique looking flowers each time I use this set! The color combination used in this first card is certainly inspired by the beach! 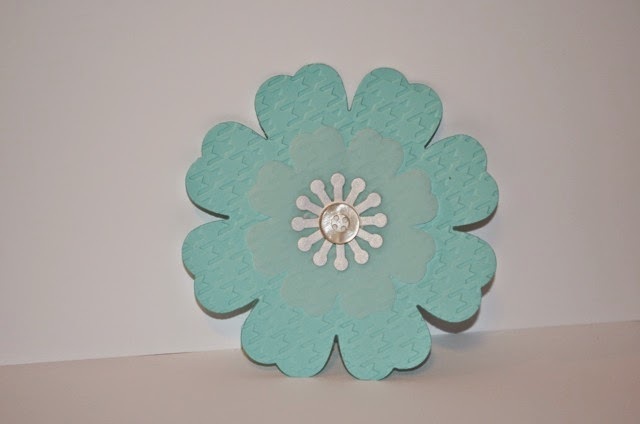 I used my favorite kraft cardstock by Cardstock Warehouse and Robin's Egg cardstock by Bazzill. Both colors are gorgeous! I also used a shimmery white card base from David Tutera. I really wanted this flower to have some texture, since I didn't have a patterned paper that really matched the blue cardstock. 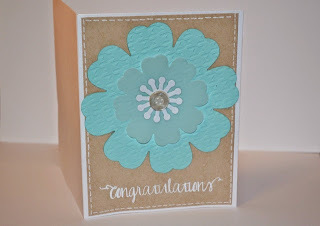 I ended up embossing the blue portion of the flower with a houndstooth embossing folder from We R Memory Keepers. I used translucent vellum for the next portion of the flower. For the center, I used a piece of shimmery white cardstock that matched the card base and glued on a button to create a definitive center of the flower. cards. I used a Sakura Gelly Roll white gel pen along the edges of the kraft to make small stitching lines. 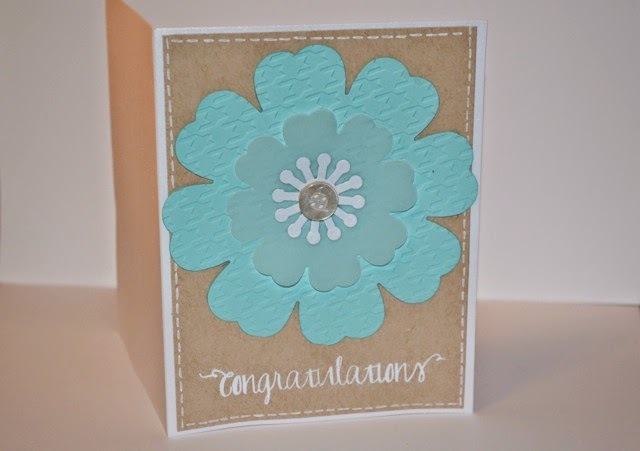 The congratulations sentiment I used is from Avery Elle's Oh Happy Day stamp set. I stamped it in Versamark ink and used Ivory embossing powder from Recollections to finish the card. For the second card, I wanted to make a general purpose card I could use for any occasion. While this card lacks a sentiment, I enjoy having the flexibility to use this card for any purpose! 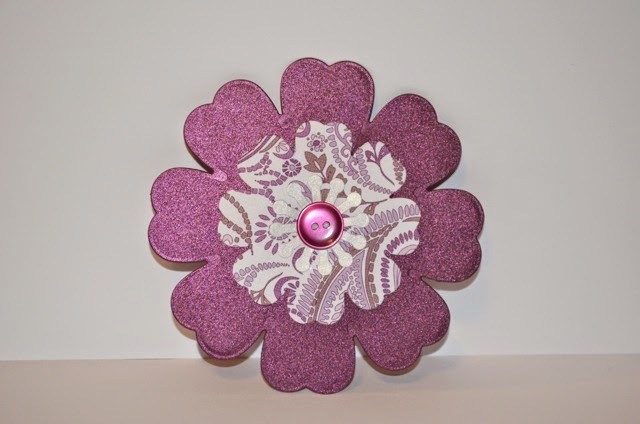 I began with a shimmery purple cardstock I purchased at Michael's and die cut the largest portion of the flower. Next, I used the next smallest flower die on a patterned paper from Recollections called Purple Paisley. 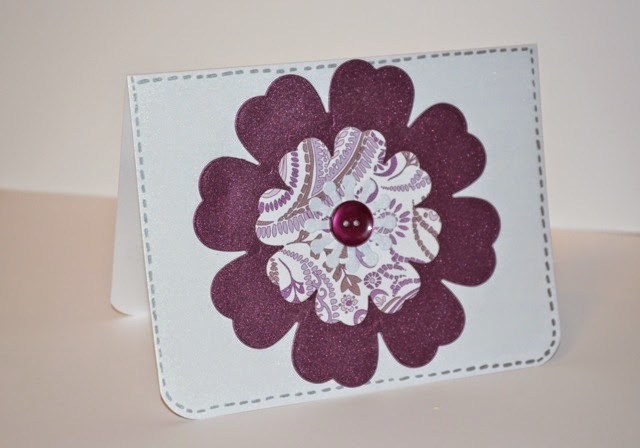 For the center of the flower, I used the same shimmery white paper that matches the David Tutera card base and added a purple button. I loved how shimmery this card was! The white and the purple look beautiful together. I added faux stitching once more with a metallic silver Sharpie. While this card is not one of my favorites in particular, I like how the flower exemplifies the versatility of this die set. Whether you use it with embossed pieces or patterned paper, it will certainly make a gorgeous embellishment for a card. Get the WRMK Nesting Rose Die Set here!